Until the early nineteenth century, antiquaries had no way of dating the site and objects they found. Then a brilliantly simple solution was put forward by the young curator of the Danish National Museum, which instantly enabled archaeologists to date their sites in a relative sequence using terms that are still in use today, even by Bad Archaeologists. The nineteenth century witnessed the main conflict between biblical literalists, who believed in a recent creation, and the new sciences of geology and archaeology, which were beginning to explore the ramifications of an ancient earth and the antiquity of the human species. At the start of the century, most ideas about geology were catastrophist: it was widely believed that rocks had been deposited by floods, volcanic eruptions and similarly dramatic events, while erosion had been caused by floods, rainstorms and so on. However, the rival gradualist view proposed that the processes that shaped the world were slow and, most importantly, are still at work today. This view became the foundation for the principle of ‘uniformitarianism’ – the idea that we can only legitimately use phenomena observable in the world today to explain what happened in the past. According to this principle, a universal flood such as the well-known biblical flood of Noah is a poor explanatory model for erosion, as we have never observed the effects of a flood of this scale to record the geomorphological phenomena it would produce. Miracles are also inadmissible as explanations as they cannot be observed definitively in the world around us and they involve the intervention of a supernatural being whose existence is not provable. Such explanations are not naturalistic. Geological explanations for the development of the physical characteristics of the world were incompatible with the alternatives of divine intervention. Changes known to have occurred in recent times were evidently the result of natural processes, such as the silting up of harbours, the submerging of towns as sea levels rose and so on. The adoption of a naturalistic, uniformitarian geological framework inevitably led to a sense that the chronology of Genesis could not be right. The processes of deposition and erosion visible in the contemporary world are very slow indeed. In many ways they are beyond the human scale. The six or seven thousand years since the Biblical moment of creation were simply not long enough to accommodate these processes. Unless the earth were created with all its signs of old age – its river deltas, its crumbling cliffs and so on – naturalistic explanations demanded a much longer chronology. There were two possible recourses for those who wished to retain a biblical timescale: a special creation complete with imperfections (acceptance of which would go against the religious view of god‘s creation being perfect) or a history of the earth complete with rapid catastrophic changes (acceptance of which would mean accepting that such changes no longer occur). Neither was an easy option. To make matters worse, the principle of stratigraphy was developed in geology, leading to the recognition of successively older strata. The remains of animals found in different strata appeared increasingly different from modern animals as the age of the rocks increased. This suggested to biologists that life on earth had changed over long periods of time. Consequently, a biblical explanation for the development of the Earth (as explained by Noah’s flood) became increasingly untenable. Occasionally, human remains or artefacts were found with the bones of some of these strange animals. It was evident to a number of scientists that this meant that human beings had been around for much longer than the biblical account suggested (but nowhere near as long as life on earth). The question of chronology was becoming an arena of fierce debate in the early years of the nineteenth century in both geology and archaeology. The geologists had a relative chronology, based on the principle of stratigraphy, but the archaeologists were still unable to sort remains of the prehistoric past into any sort of chronological order or even, in some cases, to date monuments accurately within historic periods (high medieval homestead moats in England, for instance, were often thought to be Danish fortifications of the ninth century). This was the problem facing Christian Jurgensen Thomsen (1788-1865) when he was appointed curator of the Danish National Museum in Copenhagen in 1816. His array of prehistoric objects could not be placed in any sort of order based on date. He hit on an ingenious solution. He recognised that some of the museum’s collection had come from sites where the only finds were made from stone; some came from sites where bronze was also used, while others came from sites where iron, stone and bronze were used. He suggested that those sites with only stone tools were the oldest, labelling this the Stone Age, those with bronze and stone tools belonged to a Bronze Age, while those with iron belonged to an Iron Age. In some ways, this followed the idea put forward by Hesiod. However, whereas Hesiod’s model was one of a decline from a time of perfection (the Age of Gold) to the present, sinful Age of Iron, Thomsen’s model was one of increasing technological complexity, from stone, through bronze to iron. Thomsen’s solution, which he called Museum-ordning (‘museum ordering’) but which is better known today as the Three Age System, was simple yet elegant, but he did not feel able to publish his ideas until 1836 in his guidebook to the National Museum, Ledetraad til Nordisk Oldkyndighed. He subsequently encouraged his assistant, Jens Jacob Asmussen Worsaae (1821-1885) to investigate new sites to test these ideas. In excavation after excavation, Worsaae found that the sequence proposed by Thomsen was correct and in none was it ever contradicted. His ideas were an instant success. Suddenly, archaeologists across Europe had the means to place finds in a relative sequence. If they did not know how long each of their Three Ages had lasted, that was something that it might be possible to sort out later. In the meantime, it became important to work out the sequences of finds in different parts of the world. It also became possible to correlate different types of monument with finds of different dates. In Britain, for instance, long barrows were found to be associated with burials belonging uniquely to the Stone Age, while round barrows were generally associated with burials of the Bronze Age. As time went on, it became possible to recognise that the Three Ages could be subdivided – the Stone Age in particular could be split into an Old Stone Age, when people lived by hunting animals that are today mostly extinct, and a New Stone Age, when people relied on domestic animals similar to those farmed today. Eventually, a Middle Stone Age was recognised and, in some parts of Europe at least, a Copper Age was found to have followed the New Stone Age and preceded the Bronze Age. In an attempt to sort out a chronology for this prehistoric past, archaeologists began to look at groups of finds from neighbouring regions. Similarities that could be detected were thought to show that the people who used artefacts of a specific style had travelled from one region to the next. As everyone ‘knew’ from the Bible and Classical historians that civilisation had developed first in the Middle East, these movements were always seen as being from east to west. It was only a matter of finding links with places like Egypt, where a chronology was being worked out following the decipherment of hieroglyphic writing in 1822 by Jean-François Champollion (1790-1832). These early archaeologists thought that they could do no more than document the past, especially prehistory. The main thrust of nineteenth-century arguments about how cultures change revolved around disputes between evolutionary theory and diffusion theory. According to proponents of the former, societies change in regular and predictable ways, although not all at the same rate. It should therefore be expected that similar traits will occur in numerous societies without the need for close cultural contact. According to the latter, so many innovations are unexpected that when they occur in two or more societies, they are difficult to account for without invoking cultural contact (diffusion). They believed that every shared cultural trait has to be explained in this way. Therefore, if there are pyramids in Egypt and in Central America, there must have been contact between the two areas. These people were also usually firmly attached to the idea that diffusion can only be accomplished by population movements. For diffusionists, all change in the past was brought about by the migration of humans from the great centres of early civilisation (generally in the Middle East) to Europe and even the rest of the world. Civilisation was seen as such a rare phenomenon and the apparent similarities of different cultures across the world too great that it could not be possible for each civilisation to have grown up independently. Although early proponents of social evolution, taking Karl Marx’s (1818-1883) views on the universal nature of how societies develop as their starting point, were convinced that each civilisation was a local, indigenous development, by the end of the nineteenth century, their ideas had become unfashionable. Instead, archaeologists and anthropologists pointed to similarities between cultures and began to suggest connections between them. Some took it to extremes: in Grafton Elliot Smith’s (1871-1937) extreme view, all civilisation originated in Egypt, while Gustav Kossinna’s (1858-1931) belief that all civilisation originated among an ‘Indo-Germanic’ people provided the Nazis with an academic justification for German expansion. These early twentieth-century archaeologists looked for similarities between cultures, which they believed demonstrated contact. There was no need to explain how and why ancient cultures changed, as change was something that was caused by inherently superior people from outside. These hyper-diffusionists used any similarity to make connections: institutions such as marriage, the practice of mummification and similar sounding words could be taken as evidence for the movement of peoples. These were the sorts of arguments that boosted late nineteenth-century believers in Atlantis, such as Ignatius Donnelly (1831-1901), as the source of all civilisations. By the end of the nineteenth century, the diffusionist arguments had become the most widely accepted explanations for phenomena such as the spread of metalworking, agriculture and pottery styles. Some of these views continue to be accepted today: the spread of European agriculture, for instance, is well documented from its origins in the Zagros foothills of western Asia. 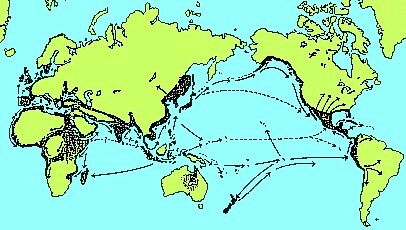 Arguments about the means of diffusion continue to be controversial: in the early twentieth century, it was assumed that much of the diffusion was of ideas, but by the middle of the century, it had become usual to view diffusion as equating with the migration of human populations taking their cultural traits with them. Thus the spread of ‘Beaker’ pottery and associated metalwork from western Iberia across the whole of Western Europe during the third millennium BCE was explained by means of the migration of a ‘Beaker folk’. One could simplify this explanation of cultural change as “pots = people”. One of the achievements of the so-called ‘New Archaeology’ of the 1960s and 1970s was to question these assumptions about diffusion that had taken on the status of fact rather than hypothesis. We can understand where these ideas came from and why they were so popular at the time. Early twentieth-century Europeans had no doubt that they were superior to the peoples across the world that they had conquered over the previous two centuries or more and were now ruling. They were bringing the benefits of civilisation to benighted savages in the same way as they believed that pioneers from the Middle East had brought it to Europe in the first place. And, after all, the Bible told of the origins of civilisation in Mesopotamia, with Abram leaving the city of Ur to become the ancestor of a new people, among whom the saviour of humanity had been born. Even if biblical accounts of human origins were now discredited, there was no reason to reject the more recent history, including the dispersal of civilised humans after the destruction of the Tower of Babel, as so much was now apparently being confirmed by archaeological discoveries.